Definition - What does Extended Leg Squat mean? Extended leg squat pose is an asymmetrical variation on the standard squatting posture that requires strength, flexibility and balance. In this pose, the yogi begins in garland pose. Placing the hands on the floor, one leg extends to the side then the hips release toward the mat. The hands are lifted to the heart center in prayer position. The pose is held for a cycle of one to three breaths then repeated with the opposite leg. 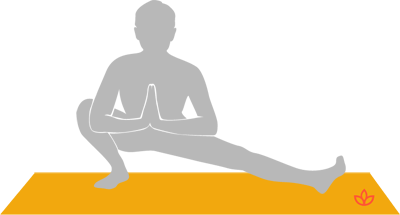 Extended leg squat pose may also be referred to as utthita namaskarasana in Sanskrit. Extended leg squat pose is a more challenging asana than garland pose and requires additional openness in the hips and flexibility in the legs. It is recommended to master garland pose before moving on to this variation. These effects may be particularly beneficial for those who experience muscular tightness in the lower body, such as runners and cyclists, as well as those who spend a long time sitting. Extended leg squat may be modified by placing the hands on the floor or on yoga blocks. To deepen the pose, the heel of the supporting leg lowers to the ground and the hips sink to the heel.